Newark, N.Y. – Former Newark Pilots head coach Chris Ebright, now in second full season at the helm at Saginaw Valley State University, will send four players to Colburn Park to compete for the Pilots in 2016. 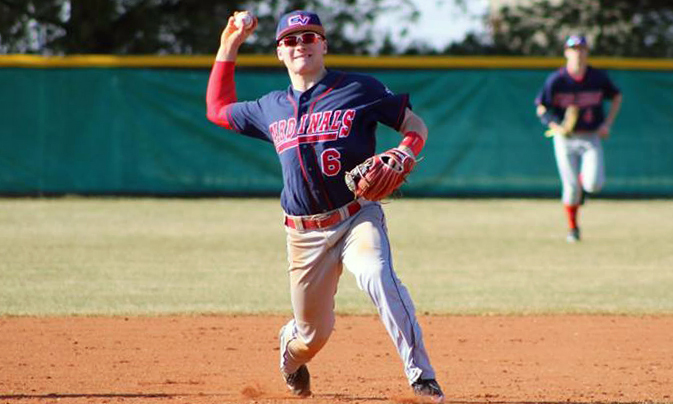 Standout infielders Brendan Harrison and Jordan Swiss will join right-handed pitcher Jacob Hendricks and outfielder Adam Turner on the Newark roster this summer. Harrison, a junior, returns to Saginaw Valley after appearing in all 41 games as a sophomore. Through the first 11 games of the season, he leads the Cardinals with a tremendous .500/.553/.735 slash line, with his average ranking second in the Great Lakes Intercollegiate Athletic Conference (GLIAC). The 6-foot-2, 245-pound first baseman has six multi-hit games, including a pair of three-hit outings against Kentucky State University on February 27 and Erskine College on March 8. Swiss has made an immediate impact on the Cardinals’ lineup in his rookie season, registering a .410 batting average and opening his career on an 11-game hit streak. The first-year shortstop has a team-high 16 RBIs – third-most in the GLIAC – and is tied for the team lead in runs scored (14). In the season-opening series against Kentucky State, Swiss hit .636 (7-for-11), including a 4-for-4 performance on February 28. In that game, an 18-0 drubbing of the Thorobreds, Swiss clubbed his first career homer and registered a season-best five RBIs. A 6-foot-2 righty, Hendricks recorded a perfect 2-0 record with a 3.96 ERA in nine appearances as a freshman in 2015. He fanned 19 batters in 25.0 innings of work. Hendricks earned his two victories in consecutive starts against the University of Findlay and Ashland University last April. So far this season, the sophomore has made two appearances, striking out three in four relief innings. He tossed a pair of scoreless innings last time out against Montreat College. Fellow sophomore Turner transferred to Saginaw Valley after spending his freshmen season at Shawnee State University, an NAIA institution in Portsmouth, Ohio. He made 35 starts in his rookie campaign, compiling a .219 batting average with four doubles, one triple, and two homers. On March 22, 2015, Turner launched a first-pitch grand slam in the seventh inning against the University of Pikeville. The Lansing, Mich., native made his first start of 2016 against Montreat on March 10 and finished with a double and three RBIs. The Newark Pilots open the 2016 Perfect Game Collegiate Baseball League (PGCBL) season on Wednesday, June 1, against the Jammers of Jamestown. The home opener at the historic Colburn Park is scheduled for Friday, June 3, at 7:05 p.m. against the Geneva Red Wings. For more information and to purchase season tickets, please contact team president Leslie Ohmann at 315-576-6710 ornewarkpilots@gmail.com. 0 Comments to "Newark Pilots Sign Four From Saginaw Valley State"